Almost every car user have changed their tire at one stage or the other. While having a spare tire is a necessity for every car owner, a floor jack is needed to carry out the task in case there is a need for changing your tire or doing some underneath maintenance. A car jack is an essential tool for every professional mechanic or DIYers who enjoy working on their automobiles. 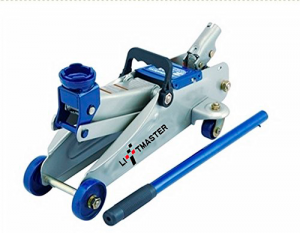 The Liftmaster hydraulic trolley is the master of all 2-ton heavy duty floor jacks. The low profile jack is handy and can lift your heavy car, truck, small SUVs off the ground level as high as 13 inches for you to do your repairs and other maintenance. The heavy-duty steel construction is portable and weighs only 30 pounds which will be enough to all your repair work. The jack is easy to move around with a safety feature that protects the device from being over-pumped when trying to lift the object. The Liftmaster is one of the best low profile jacks on the market that will give you fast and easy lifting without stress or hassle. The floor jack handle only requires a slow twist to bring it back down smoothly with an easily controlled switch. The jack comes in a stylish shinny color at an affordable market price. The Liftmaster provides better access to the ground and a lifting range of 14 inches. The jack is portable to store and can quickly be moved around. The floor jack is a remarkable tool for mechanics and DIYers in search of super lightweight, durable and heavy duty jack. The Liftmaster comes with great features that make it easy to use and store. It comes with a 360-degree swivel saddle for heavy lifting, perfect for most cars, SUVs, trucks. The tool has a rust-resistant finish and a heavy gauge steel frame that provides strength and extended lifetime. The car jack is easy to use as it lifts your vehicle in a matter of seconds with just a few or little pumps, while lowering your vehicle only requires a push bottom to release the pressure of the Trolley Jack. The jack will work for any car, truck, SUVs as long as they fall under the 2-ton threshold. The service provided will leave you more than happy with the speed, strength, stability, lifting range to durability. The Liftmaster Hydraulic Trolley Floor Jack combines power and speed, with a year guaranty and an instruction manual to assist you.